Kryooprema delivered cryogenic equipment for LOX, LIN and LAR stations as well as for hydrogen station for General Electric/Energoprojekt for Calaber Project in Nigeria. Deliveries included also 8 regulation, control and safety rack stations for gas supplies to the various End User’s equipment. The investment cycle in new production facilities began in 2016 and planned to be concluded in 2017. It consists of a new production shop and automatic welding equipment following the increased demand of our cryogenic equipment home and abroad. Kryooprema received the ISO 9001-2015 Certificate from TUV Thuringen as the first production company in Serbia. The company was certified for the first time in 2007 for ISO 9001-2000 (TUV Sud) then for ISO 9001-2008 in 2011 (TUV Thuringen). Celebrating 25 years, Kryoorema has established itself as an international cryogenic equipment manufacturer and service provider. Kryooprema has begun its first cryogenic equipment deliveries to Russia as a very promising market for the company. The company has introduced pressure strenghtening method into the production of transpotrtable tanks (TPED, EN1251, EN13530) after successful application of this method in manufacturing of stationary cryogenic tanks beginning from 2011. The company has got the first orders from the Gulf region supplying the vertical bulk tanks, horizontal and pallet transportable tanks. Kryooprema has introduced in its production programme a gamma of Microbulk Pallet Tanks with capacities 600-1000-1500-2000-2500-3000L and MWP 24/37 bar. Kryooprema successfully completed the participation at Achema 2012 Trade Fair by hosting a great number of visitors. Among them were the well known EU and global industrial gas companies as well as the engineering companies and individual customers from Europe, Middle East and Asia. Kryooprema has introduced in its production programme a gamma of Compact Stations, vertical with capacities 3000L/50Nm3/h and 6000L/100Nm3/h, MWP=19/24/37 bar and horizontal on the pallet with capacities 2000L/50Nm3/h and 3000L/100Nm3/h , MWP=24/37 bar. After successful outcome of the tests made on experimental vessel, supervised by TUV, Kryooprema has introduced cold stretching method (EN13458, Annex C) in production of vertical stationary cryogenic tanks with design pressures 16/24bar and volumes from 3000L to 30000L. 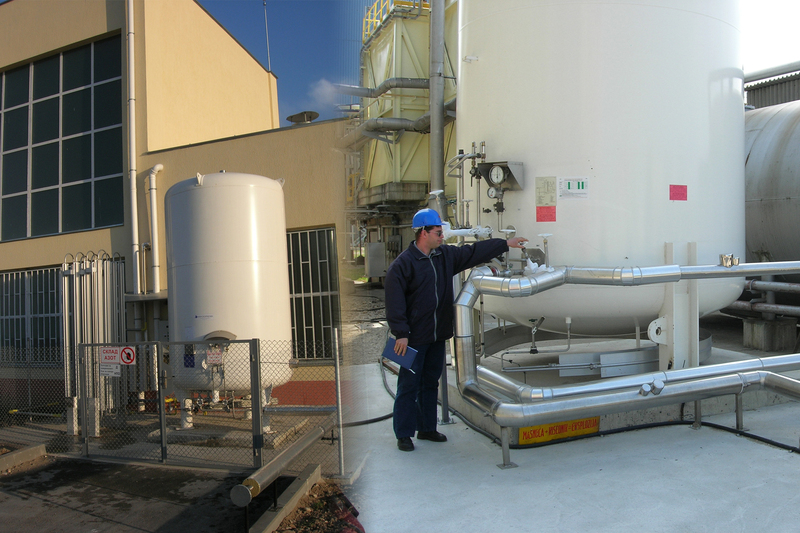 The experience in a past 15 years confirmed the quality of multilayer and perlite insulation in a Kryooprema's cryogenic transportable and static tanks. Therefore, the company decided to extend vacuum warranty for those tanks to 5 years. Kryooprema, cryogenic, vacuum and processing equipment production company, founded in 1991, has become regional leader in the field of cryogenics. We are specialized in storage, transport and vaporization of cryogenic liquid as well as for custom made cryogenic equipment, repairs and refurbishments. The company certified to ISO 9001; AD 2000-Merkblatt HP0, EN ISO 3834-3, TP TC 032/2013 designs and manufactures equipment conforming to PED (CE) and TPED (π) EU Directives. Kryooprema is also active in engineering projects such as: cylinder filling plants, acetylene plants, cryobiology laboratories and workshops for maintenance of cylinders. In the field of vacuum equipment and components, Kryooprema designs and manufactures vacuum chambers/vessels and vacuum systems for industrial and scientific applications. The vacuum components, based on ISO-KF; ISO-K and CF standards, also make a part of our production programme. Recognized for its high quality products, Kryooprema has been selected by scientific community to deliver equipment for special projects such as: Large Hadron Collider in CERN, Switzerland ("A" stainless steel neutron shields supporting frames) and experimental vacuum systems for Institute of Physics, Faculty of Physics in Belgrade and Institute for nuclear sciency, Belgrade.